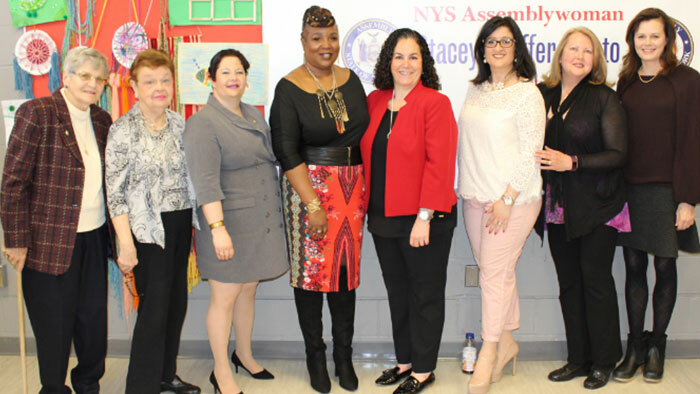 Assemblywoman Stacey Pheffer Amato (D-Howard Beach) recently announced the opening of nominations for her 2nd annual Women of Distinction Awards to celebrate women throughout the 23rd Assembly District who have shown great strength in their actions to foster a brighter future for all. Awards will be given for work in various fields, including health care, business, volunteer work, humanitarian work, education and military service, Pheffer Amato noted. “Our first annual ceremony was a huge success, so this year we are looking to expand on that success! We can never show complete thanks to these Women of Distinction, but to honor them with a special award is one step we can take to show our gratitude,” said Pheffer Amato, (c., posing with 2018 Women of Distinction). Nomination forms can be found on Pheffer Amato’s website: assembly.state.ny.us/mem/Stacey-Pheffer-Amato or by contacting Pheffer Amato’s office at (718) 945-9550. The deadline to submit nomination forms is March 1. The forms can be returned via email amatos@nyassembly.gov or fax (718) 945-9549. Winners will be honored at an awards ceremony in March, date/time/location to be determined.